For the first time since it started in 2015, the Trinity Schools Book Award (TSBA) has been awarded jointly to two authors. 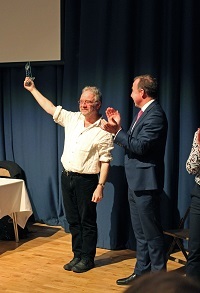 At a ceremony at Caterham School in Surrey last Friday, attended by students from 15 of the 22 schools that took part in TSBA this year, the Award was presented to Alice Broadway for her debut novel Ink (Scholastic) and to Paul Dowswell (pictured) for Ausländer (Bloomsbury). Students from the participating schools voted for their favourites from the shortlist, which this year took as its theme Secrets and Lies, and the result was a tie. Ausländer is a historical novel about a Polish boy in Nazi Germany, whilst Ink is a fantasy set in a world where your life story is tattooed on your skin. The other four shortlisted authors were Nicholas Bowling (Witchborn, Chicken House), Frances Hardinge (The Lie Tree, Macmillan Children’s), Muhammad Khan (I Am Thunder, Macmillan Children’s) and Kim Slater (The Boy Who Lied, Macmillan Children’s). Four out of the six shortlisted authors were present at the ceremony to answer questions and meet the audience of students and staff from the participating schools. Deborah Moore, librarian at Caterham School and TSBA Committee member, said: "This year’s shortlist truly had something for everyone, as can be seen from the closeness of the result. We are delighted that the award has gone to two worthy winners from an extremely strong shortlist. Paul is an established author, who has been shortlisted twice before; Ausländer has really made students think about what it might be like to have to live a lie in order to survive. By contrast, Alice’s career has just begun, but her accomplished rendition of an imagined world generated much discussion and creativity around issues of identity and loyalty." Now in its fifth year, the TSBA was launched by librarians from 22 independent senior schools in the Trinity group, with the aim to celebrate quality writing in both new and older fiction. The TSBA Committee determines a theme each year and shortlists books nominated by librarians in the Trinity group. Participation now extends beyond the group to any interested secondary school. 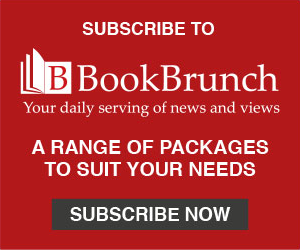 Secondary school children from the ages of 11 to 14 read the shortlisted books through the Autumn and Spring terms and cast their votes in February to determine the winner. Student competitions also run alongside the main book awards for the best book reviews and best creative response to a book, which included original music, video, paintings, poetry, sculpture and models. Next year’s shortlist, on the theme of Stand Up, Speak Out, will be announced in June.